solar power gives you the freedom to position your gate exactly where its needed. We install systems which give dependable performance all year round.How? Extensive research into low power consumption electronics. We work out the potential load for each installation to ensure it will work successfully. In the UK typical solar energy levels in December are less than a third of that available in the summer. As a result the size and angle of the panel is set to give optimum winter performance. Deep cycle batteries are capable for storing enough charge for several days operations during dull spells of weather. Depending on the requirement, up to 4 batteries are used. We provide a steel support system onto which the 260W panel is mounted. The batteries are then stored within the structure. For high security locations we bury the batteries in a special enclosure below the ground to prevent battery theft (this is not a general problem, in 4 years we have had two occurrences). The panel will need to be positioned away from shade pointing due south. The panel needs to be kept reasonably clean and free of dirt and snow. If you think you might need additional accessories in the future, build the capacity in from day 1 to give you flexibility for the future. Many of the kits available on the internet are designed for sunnier climates and may not work all year round in this country. We base our calculations on sunlight data captured in the UK at numerous locations to ensure you are not let down in the middle of winter. Our first installation, a 100W 24V system set on a farm drive near Huntingdon. Relatively low usage, this gate opens and closes on a timer and has radio remote operation and a keypad for access outside of hours. Never knowingly run out of power. 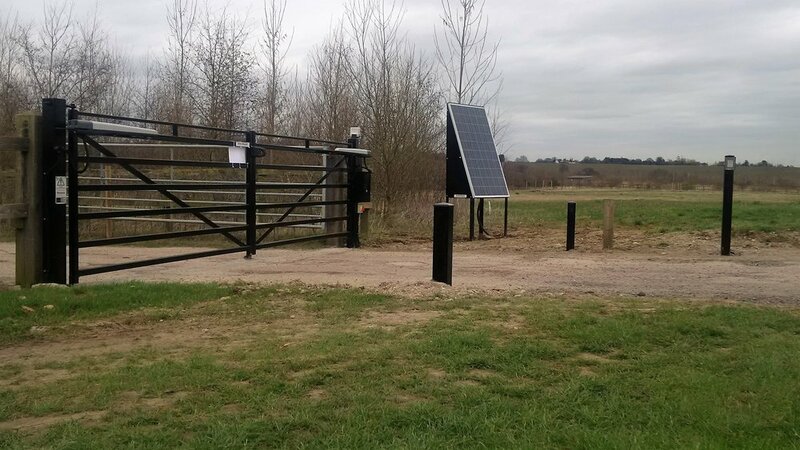 High capacity standalone solar system set on a country road near Mildenhall in Suffolk. Installed onto an existing gate. A high-use gate on a private road near Burnham on Crouch. Operated by radio fobs, a keypad and GSM intercom. 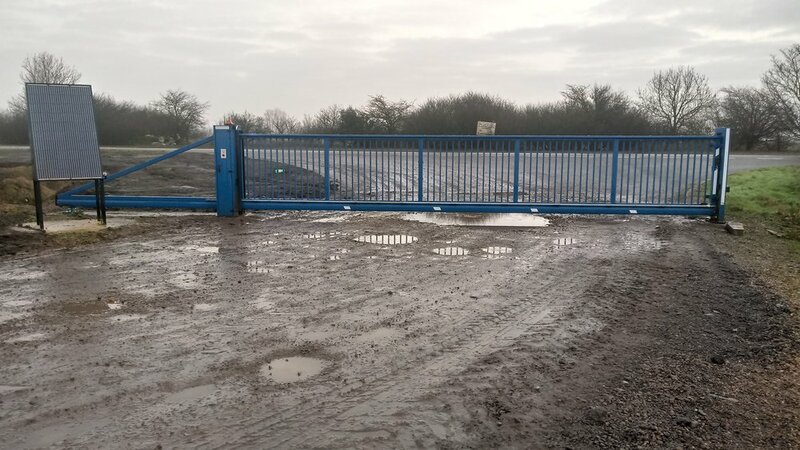 Solar powered 8 metre cantilever gate near Thrapston, Northants. A busy goods entrance at the RHS Hyde Hall, Wickford, Essex.